im just curious, what kind of oats do you buy? do you buy mccanns? bobs red mill certified gf? an other? we do mccanns and haven’t noticed any reactions (GF/CF house here). i am very much aware that it isnt certified GF, but we havent had a problem here. thanks! I actually just use quaker. I have also bought it in bulk from a local grain store. My daughter has a very mild delayed allergy to wheat so it is not important to us that it be gluten free. So Quaker is definitely gluten free? Quaker is NOT certified gluten free. We do not have issues with gluten but with wheat itself. I know the difference can be confusing. If you have issues with gluten you sould probably buy certified gluten free oats unless your doctor clears you to try regualr oats. I know this was posted 5 years ago but I just wanted to tell you, Least Recommended are Rolled Oats and Quick Oats, that is Oatmeal. these are oat groats that have been steamed and rolled flat. Quick oats are steel cut oats that have also been steamed and rolled flat. This processing destroys the enzymes and exposes the oats nutrients. Rolled oats and quick oats do not have as much nutritional value as oat groats or steel cut oats due to being more processed. Quick oats have the least nutrition of them all because they have been processed the most. The Best Type of Oats for Oat Flour are Oat Groats Oat Groats are whole oats with their husks removed that look similar to wheat. Not only do oat groats flow better through the electric grain mill but all their nutritional benefits are protected in their whole grain state, during storage or sitting on the shelf. These whole oat groats also retain more of their terrific oat taste for your homemade oat flour. Recommend soaking the oats overnight in a mild acid, warm water solution. The acid can be whey (as in you make it yourself), lemon juice, or vinegar. In the morning, rinse and dry it out in a dehydrator or on low in the oven. This removes phytic compounds that inhibit digestion. Great advice Pavil! I have gotten out of the habit of soaking my grains. I need to work on that. 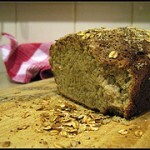 I am so glad to read how easy it is to make oat flour! I can’t wait to try this! At what point do you recommend testing out whether or not a gluten-intolerant individual can tolerate oats? My daughter is gluten intolerant, and, so far, I’ve been using Bob’s Red Mills GF oats. It would be much cheaper if I didn’t have to worry about making sure they were GF! Thank you! That’s a great question! I think that would be a question for your doctor. We are dealing with a wheat allergy and not gluten intolerance so this is not an area I know a lot about. When you find out would you please let me know? Only Oats is another brand that is gluten free and is about $4 for a big bag at London Drugs! I have never thought of using an oat flour. I do use an AP GF flour for all my baking needs, tho. But, this seems like it would be more cost effective and would add some flavor and alternative to my baking. You are very welcome! It’s not the same as ap mix, but I find it easy to make and more affordable. Hi NancyI’d like to ask if it’s necessary to soak the oat flour overnight for better absorption of nutrients? Hi Grace, One could certainly soak the oat flour overnight. I’ve gone through phases where I do regularly. Lately, I use it fresh. Coffee grinders do an excellent job of grinding oats as well! That’s right! Thank you Shelley! I found you today when I was looking for a wheat, egg, dairy free receipe for oatmeal muffins. I just wanted to say thank you for posting this. My husband is allergic to wheat, dairy, egg and corn so right now I substitute the corn items from your recipes but if you ever find any that include no corn please let me know. Thank you again. What can I use instead of oats ? GF flour or SR flour ?